Perioral Dermatitis Natural Cure - I saw results in two weeks! I found out two weeks ago that I have been living with low-grade to mild perioral dermatitis. What always appeared to just be nostril and chin redness (perhaps, due to years of sun damage or smoking I wrongly presumed) was in fact the dreaded PD. This simple statement sent me on an internet journey that led to a skincare routine overhaul, supplement expansion, and major lifestyle changes. The result: I have the best skin I’ve had in years right now and my perioral dermatitis is almost completely under control, if not almost gone. My aesthetician friend for spotting and diagnosing my PD! Melissa of the blog, JNSQ.com, who struggled with PD and was an amazing resource suggesting products to swap and ingredients to avoid! According to the American Osteopathic College of Dermatology perioral dermatitis “is a facial rash that tends to occur around the month, nose or even the eyes.” It mainly affects women aged 30-50 and while it is mostly trigger by topical steroids irritants like, cosmetics and skincare can bring it on. It may come and go over months or years. The difficult part about this is that there is no test for perioral dermatitis, which is why it is one of the most undiagnosed or misdiagnosed skin conditions. As for treatment, there are two schools of thought: antibiotics or the natural path. I discussed both with Melissa and she was adamant that antibiotics were a bandaid that would remove the good and bad bacteria on the skin, but once you stopped taking them (since the microbiome would still be out of whack) everything would come back – worse. But by searching out a perioral dermatitis natural cure and working with the body it would be best for the long run and she was a prime example that it could be done. After researching online, I realized right away that I had perioral dermatitis, which was definitely spurred on by topical steroids. I avoid topical steroid creams, but remember using a drugstore hydrocortisone cream last Christmas when a pimple-like rash broke out all over my face after testing an essential oil treatment product. I used the hydrocortisone on and off for a week. Though, I’m not a medical professional, from online research it appeared to me that my skin issues were a combination of both perioral dermatitis and rosacea. The two are both inflammatory skin disorders, but according to rosacea.org perioral dermatitis is more an allergic reaction, while rosacea is a chronic inflammatory condition. I decided to approach solving my skin rash as though I had both. Here are the skincare, lifestyle, diet, and supplement changes I sought out as a perioral dermatitis natural cure and saw results in under two weeks! The photo on the left was taken one week into my treatment plan. Unfortunately, I don’t have any images from when it was worse. The photo on the right was taken today two weeks after making radical changes following my perioral dermatitis natural cure. 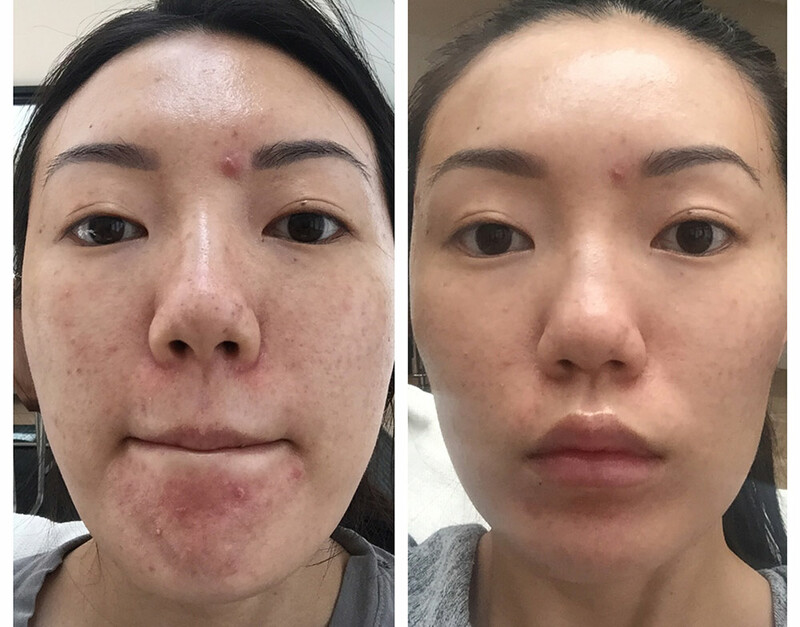 I wish I had a picture of when my skin was worse… but I avoided pictures… This is just to show you how fast things can change with the right skincare, lifestyle, diet and supplements. I alternate between these two cleansers depending on if I’m showering or washing at the sink. 1. I wash my face with Uriage Xemose Gentle Cleansing Syndet at the sink. I use four serums in this order. 3. You Skincare Clarifying Glow Serum: It was made by my friend who is a skincare chemist and contains soothing and wound healing ingredients, like licorice, Centella Asiatica and aloe. But I love that there are skin lightening ingredients like, Arbutin and Lemon Peel Ferment Extract. They block melanin synthesis and lighten post inflammatory acne red marks. 4. Kristina Holey + Marie Veronique Soothing B3 Serum: In Marie Veronique’s book she stresses the importance of B3 aka Niacinamide, which has been found in studies to be a powerful anti-inflammatory ingredient for both acne and rosacea. This serum contains 10% Niacinamide, as well as Vitamin B5 (essential for healthy skin and hair). 5. Kristina Holey + Marie Veronique Intensive Repair Serum: This serum contains apple cider vinegar, which Marie Veronique says is a pH balancer. It also contains lactic acid and salicylic acid to decongest the pores. Salicylic acid aka BHA is small enough to get inside the pore and help exfoliate it from the inside out breaking up congestion. *TIP: This serum can be sensitizing, so it’s important to only use this serum 2x per week and then gradually increase or spot treat as your skin becomes acclimated. 6. 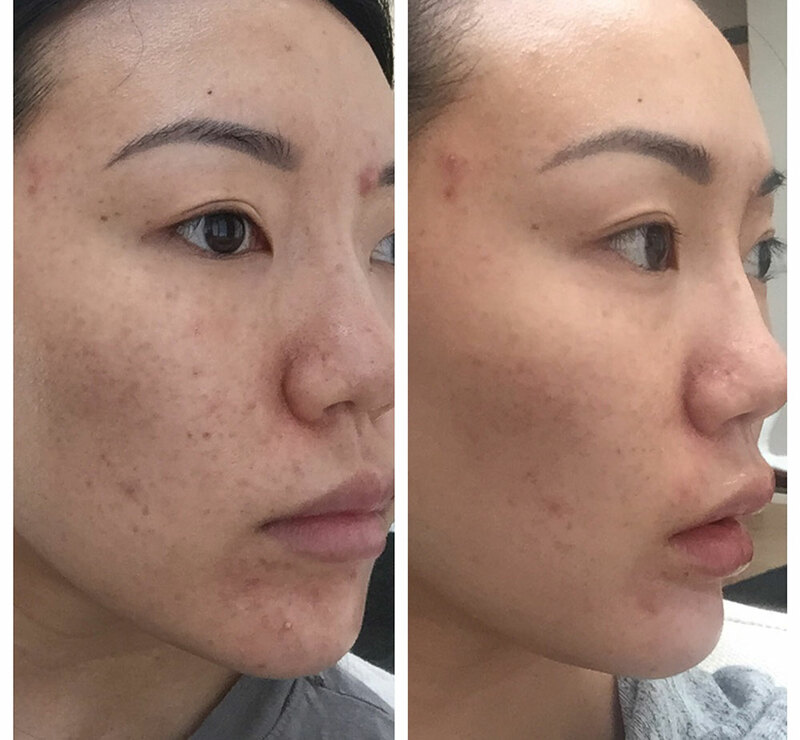 Kristina Holey + Marie Veronique Barrier Restore Serum: The final step in my serum series. It is the thickest and is meant to go last. It contains pre and probiotics to help balance the skin microbiome. It also contains colloidal trace minerals and zinc oxide, both, Marie explains in her book, reduce inflammation. *I was hesitant about using the three Kristina Holey + Marie Veronique serums. When I first received them as a PR gift I tested them one at a time. First, I tried the Intensive Repair Serum for a few nights and it irritated my skin, then I tried just the Soothing B3 Serum for a couple of weeks and I didn’t notice any improvements. But what I realized later after discussing with Melissa, who was coincidentally Kristina Holey’s client in New York and the person Kristina created these serums for (they were created specifically for perioral dermatitis), I learned these serums must be used all together for best results. In my case, any results. I HIGHLY recommend using all three of them! I use three moisture serums next and a light lotion. 7. I use a gentle aloe gel. For the first week, I used Amara Organics Aloe Vera Gel, but then I received the Susanne Kaufmann After Sun Gel which I like a lot better. It has aloe vera, cardiospermum (anti-inflammatory ingredient that treats redness and dehydration), and CUBE3 (a hyaluronic serum featuring three different size HA molecules derived from fungus and fermented flowers). The Amara Organics is good, but the SK product is AMAZING. It’s not available yet in stores, but will be coming soon at the end of May 2017. 8. I really like this hyaluronic acid serum from Japanese brand, HadaLabo JAPAN Skin Institute. It’s cheap, basic, but gets the job done. 9. I use a pea size of the KOSE Infinity Advanced Moisture Concentrate Serum (it says serum, but the texture is like a light gel cream). I bought in Tokyo a few months ago. It’s in Japanese, so I actually don’t know what’s in this product, but I received a sample while I was there, tried it and fell in LOVE. I notice it helps brighten and hydrate my skin. *The only downside to this “serum” aka gel cream is that I haven’t been able to find a US retailer. The only available places to buy it online are via eBay retailers. 10. Then to seal everything in I use the Avene Eau Thermale Restorative Skin Cream that Melissa recommended. It’s very basic, fragrance-free, light, but nourishing. While I would never advise others to do this, I personally stopped wearing sunscreen as I read that it can be an irritant. Marie Veronique’s book recommends avoiding chemical sunscreens since they can trigger the production of free-radicals and inflammation suggesting to instead opt for physical ones. But I personally decided to invest in Coolibar UPF 50+ hats, scarves and a face visor from Sovis (which I use only in the car) to give my skin a break from sunscreen during this healing process. Sodium lauryl sulfates are a common chemical in shampoos that make them lather. It is also a skin irritant and an ingredient to avoid when dealing with skin issues. I’ve been using the Rahua haircare line that’s nontoxic and natural. It contains rahua oil that’s rich in omega-9s and helps to strengthen hair. Read my review of the line here. *I also use January Labs Restorative Tonic Mist on my scalp after showering. It’s amazing for rebalancing the scalp’s pH, reducing oiliness, flakes and itchiness. This has helped reduce how often I need to wash my hair, which subsequently means my skin is less exposed to hot/warm showers. Fluoride can also be a trigger for skin irritation. I purchased a recommendation from Melissa that I love – Desert Essence Natural Tea Tree Oil Mint Toothpaste. I did also buy Tom’s Fennel toothpaste, but was very disappointed when I saw on the back of the box it contains sodium lauryl sulfate! My skincare routine may have just exhausted you, but that’s only the tip of the iceberg. I also have made some important lifestyle and dietary changes the past few weeks to influence my skin internally. Every body needs supplements specific to their bodies’ needs. Most of these supplements I was taking prior to self-diagnosing my PD. The only ones I added the last few weeks are the Primrose Oil and Zinc. These are the supplements I’m taking based on research I have done, but please consult your physician before beginning a supplement program that’s right for you. It’s funny how all of the changes I have made I’ve wanted to do for a long time, but could never commit when the end goal was simply health. Yet, somehow, when it involves my skin suddenly making all of these changes is so easy. I guess it’s true what they say: When you really want something, you will make it happen. Or, I’m just super vain. Probably, both. I hope this helps others out there struggling with periodical dermatitis. If you have any questions, please feel free to reach out! This is by no means an exact guide for others, it’s just what I’ve experienced and found on my journey towards finding a perioral dermatitis natural cure. ***A few months have passed since I first wrote this article, and I for an updated review of how my perioral dermatitis is doing, the products I’m using (the list is much shorter now) and pictures of my skin – check out this post. ***Looking for makeup that’s nonirritating for perioral dermatitis? Read this article here where I dive into makeup products that I’ve found work for me with my PD. Next Post Ask An Aesthetician: How do I get rid of post-natal melasma?